Digital Assistants (PDAs), Smart phones, mobile ... purchase order, authorization, and capture payment ... employs a digital signature scheme with message. 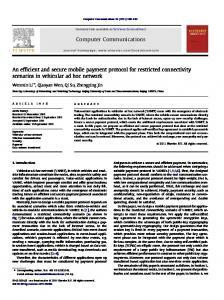 AbstractâGrowing of wireless networks and popularity of mobile devices represents an incredible opportunity to empower them as a payment device. card microchip that conforms with ISO-14443 , embedded within an e- ...... challenge (RndC2) IS creates a checksum according to ISO/IEC 9797-1 MAC. Abstract In this paper, we proposed a new agent-assisted secure payment protocol LITESET/A++, which aims at enabling the dispatched consumer-agent to choose the “best” one after negotiating with merchants to close a deal, autonomously sign contracts and make the payment on behalf of the cardholder without the possibility of disclosing any secret to any participant. This is realized by adopting the Signature-Share and Signcryption-Share schemes, and employing a Trusted Third Party (TTP). In LITESET/A++, the principle that each participant knows what is strictly necessary for his/her role is followed as in SET payment protocol while the non-repudiation property is improved. encryption is certainly a risk. In LITESET/A++, by adopting the Signature-Share and Signcryption-Share schemes, the agent can sign contracts and pass the payment information to the PG in corporation with the Trusted Third Party (TTP) without the possibility of disclosing any secret to any participants. The rest of this paper is organized as follows. Section 2 briefly reviews SET, the Signcryption-Share scheme and Signature-Share scheme. LITESET/A++ is presented in Section 3 and its features and security properties are analyzed in Section 4. Section 5 finally concludes our work. 2.1 SET We will first review SET in this section. The SET protocol  is composed of several kinds of transactions, ranging from certification of participants, to purchase requests and to payment processing. It uses two distinct asymmetric key pairs, one for key-exchange. The corresponding public key yKA is contained in public key certificate CK(A) of participant A. The key pairs (yKA, xKA) are used for encrypting and decrypting messages. Another key pair is used for the creation and verification of signatures. The public signature key of participant A is included in the signature certificate CS(A). In this paper we are particularly interested in the purchase request phase, which can be outlined as follows (see Figure 1): Step 1. When a consumer, called a cardholder (C), decides to purchase something from a merchant (M), he/she sends a request to the merchant’s server. The request includes the description of the services or the quantities of the goods, the terms of the order, and the brand of the credit card that will be used for payment. Step 2. Upon receiving the request, the merchant sends back its own signature certificate CS (M), and the key-exchange certificate CK (PG) of a payment gateway (PG). The payment gateway is a device operated by a financial institution with which the merchant established an account for processing payments with the brand used by the cardholder. The merchant also sends a unique identifier, assigned to this transaction. Step 3. The cardholder verifies the certificates by contacting a certificate authority (CA) He/she receives back a confirmation that assures the authenticity and integrity of the data (the merchant had digitally signed it), and creates two pieces of information: • The Order Information (OI), containing control information verified by the merchant to validate the order, card brand and bank identification. The OI also includes a digest of the order description, which includes the amount of the transaction and other elements such as quantity, size and price of the items ordered, shipping and billing addresses, etc. The Payment Instructions (PI), containing the amount of the transaction, the card account number and expiration date, instructions for instalment payments (if that’s the case) and a couple of secret values to prevent guessing and dictionary attacks on the data, among other elements. The PI is encrypted with a randomly generated symmetric key, K. Both elements will contain the transaction identifier and are dually signed, so they can later be linked together by the payment gateway. Then, the encrypted PI (i.e. EK(PI) ), and the key (K) used to encrypt it are encrypted into a digital envelope (EPG), using the payment gateway’s public key. Finally, the OI and the digital envelope are sent to the merchant, along with the cardholder’s signature certificate CS (C). confidentiality. Each participant knows what is strictly necessary for his/her role. SET/A, SET/A+ and LITESET/A++ are existing agent-based secure payment protocols. We will compare them with LITESET/A++ in section 4. With c and all (r, si), B can decrypt c, obtain the plaintext m and verify the signature. Figure 3. Signcryption-Share scheme 2.2.3 Signcryption-Share Scheme. Signcryption-Share scheme is based on signcryption too. In this scheme, the sender A wants to send a message m to recipient B through t sharing parties, say Ai (i=1…t). The secret signature key of A is shared by t parties, xA = xA1+ xA2+ …+ xAt. Each party generates the shared signature si on hash value r obtained from A, and all the shared signatures are sent to B with the ciphertext c. With c and all (r, si), B can decrypt c, obtain the plaintext m and verify the signature. dispatched agent does not carry its shared private signature key. Instead it only carries two half shared signatures signed on the order information (OI) and payment information (PI) respectively by the cardholder that should be sent to the merchant and payment gateway accordingly. The shared signature key is kept by the cardholder. The other 2 half signatures are generated with the assistance of TTP. The merchant can verify the order information (OI) and check the data integrity. Meanwhile the payment gateway (PG) can not only decrypt the payment information PI but also check the data integrity after obtaining the shared signatures from the agent and TTP respectively. This is better than using a symmetric key only as in SET, SET/A, SET/A+ and LITESET/A+. Additionally, non-repudiation property of LITESET/A++ is significantly improved. 3.1 Secret-Sharing of Cardholder’s Signature Private Key xSC The consumer agent CA and TTP share the cardholder’s signature private key xSC based on shamirthreshold scheme . xSC= xSTTP + xSCA Namely, according to the two share schemes presented in Section 2.2 and 2.3, A1=CA, A2=TTP. 3.2 Description of LITESET/A++: Secure Agentassisted Payment Protocol Step 1: Cardholder C generates a pair of temporary session keys -(KyPG , KxPG), where KyPG=gKxPG mod p- for the payment gateway. It is different from PG’s public encryption key pair (yKPG, xKPG). 1) Then C uses signcryption algorithm to encrypt the payment information (PI): (k1, k2)=H(KyPGz mod p) c->PG=Ek1(PI) r->PG=KHk2(PI) s->PG-1=z/(r->PG+ xSCA) mod q and ciphertext EyKTTP(xTTP||z||(KxPG+R+IC+TC+ Te)); - R is a random number chosen from [1, …, q-1]; - IC is the transaction identifier assigned by cardholder; - and TC is timestamp at C; - and Te (Te >TC) is the time when the purchase request expires. It is unique to each purchase order. CA->TTP: CS(C), CS(M), CK(M), CK(PG), Te , EyKTTP(xTTP||z||(KxPG+R+IC+ TC+ Te)), r->M , r->PG, IM When receiving the message, TTP verifies the validation of CS(C), CS(M), CK(M), and CK(PG), checks if current time TPG and r->M respectively. s->PG-2=z/(r->PG+xTTP) mod q s->M-2=z/(r->M + xTTP ) mod q, and computes EyKPG((KxPG+R+IC+TC+Te)||s->PG-2) and EyKM(s->M-2). (note: TTP knows (KxPG+R+IC+ TC+ Te) but doesn’t know KxPG) TTP keeps RCT1=(CS(C), CS(M), IC , TC,, Te, IM , TM-1, TTTP, ySM(H(CS(M), Ck(PG), IM, TM1))) as a non-repudiation receipt and sends a message to CA TTP->CA: EyKM(s->M-2), EyKPG((KxPG+R+IC+TC+ Te)|| s->PG-2), TTTP, SIGTTP where TTTP is the timestamp at TTP, SIGTTP = xSTTP(H(CS(C), CS(M), CK(PG), EyKM(s->M-2), EyKPG((KxPG+R+IC+ TC+ Te)||s->PG-2), r->M , r->PG, IM ,TTTP)) is the signature generated by TTP at time TTTP. If all are correct and current time TCA: CS(M), TM-2, SIGM where TM-2 is the timestamp (TM-2 > TM-1) at M when the SIGM is issued; SIGM= xSM(H(CS(M), r->M , s->M-1, s->M-2, OI, H(PI), IC , Te , IM , TM-2)) is the signature generated by M at time TM-2. If the payment is authorized, the merchant will fulfill the order by delivering the products bought by the cardholder. Step 10: The agent verifies the merchant signature certificate, checks the digital signature of the response, and then returns back to its owner carrying CS(M), CS(TTP), CK(PG), TTTP, TM-1, TM-2, SIGTTP, SIGM. The owner takes any appropriate actions based on its contents. the ciphertext, this helps to ‘mask’ the ciphertext so that it is not possible for M to guess KxPG by trials of encrypting messages to obtain the same ciphertext. (4) The property of non-repudiation is improved. In terms of non-repudiation, timestamps are important in many electronic transactions indicating the time that a particular event or action took place . Beside TC, more timestamps are added in different stages, such as Te, TTTP, TM-1and TM-2. In the message from TTP to CA (in Step 5), and the message from M to CA (in Step 9), signatures are added including timestamps. These signatures adopt nested structure that can show message exchange processes between CA, TTP and M. Meanwhile the generation of signatures will not significantly increase the burden of the agent to migrate back to the cardholder since the signatures are generated on the hash value, which has a fixed length (e.g. 128 bytes by MD5). As we analyzed in section 1 and above, LITESET/A++ corrects the security flaw in LITESET/A+ so that it is not possible for the merchant to re-generate the private signature key of the cardholder. Meanwhile the flexibility for the agent to “sign” on behalf of the cardholder and make a deal with the merchant remains unchanged. Moreover, with the involvement of TTP, the agent in LITESET/A++ does not need to do any encryption and decryption. In contrast, in SET/A+  and LITESET/A+ , the agent executes at the merchant’s server and completes encryption operations. In LITESET/A++, both the Signature-Share scheme and Signcryption-Share scheme are used. For the first one, it is similar to LITESET/A+ . The Signcryption-Share scheme is used to pass the session secret key to the payment gateway while no participant but PG can decrypt PI and check the data integrity. In the process, TTP not only generates a shred signature s->PG-2, but also helps encrypt EyKPG((KxPG+R+IC+ TC+ Te)||s->PG-2) without the possibility of knowing KxPG. Moreover, as the cardholder’s signature is dynamically generated with the assistance of TTP, LITSSET/A++ avoids the flaw in SET/A+  using a pre-generated signature that can be abused by any merchant causing the loss of the cardholder. In addition, the non-repudiation properties in SET/A , SET/A+  and LITESET/A+  are all week. dynamically and flexibility chose the merchant and sign on behalf of the cardholder in corporation with the TTP without the possibility of disclosing any secret to the merchant and TTP. In LITESET/A++, the principle that each participant knows what is strictly necessary for his/her role is followed as in SET while the nonrepudiation property is improved. In comparison with other agent-based secure payment protocols, it can prevent the replay attack and has improved the nonrepudiation property. For future work, we would like to integrate the LITESET/A++ protocol into our existing framework, PumaMart - A Parallel and Autonomous Agents based Internet Marketplace [25, 26, 31] implemented on top of JDK  and ASDK [28, 9] where agents are employed for shop searching/filtering, offer/searching/filtering and negotiating on behalf of the consumer. 6. 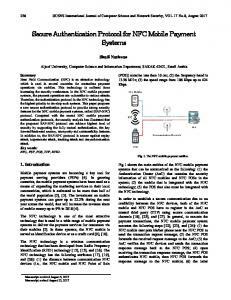 Acknowledgement This work is supported by the start-up grant of ICS division of Macquarie University (9600/0004). 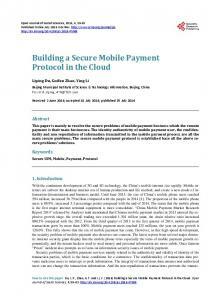 Report "LITESET/A++: A new agent-assisted secure payment protocol - e ..."